A new G Guardian for Aqua Force, tied to the Blue Storm sub-clan. Auto Wave – 1st OR 4th and Onwards: When this Unit is placed on (GC), during that battle, this Unit gains Shield+10000. And Now For A Word From The Vnaugard R&D Department!! Today’s Card we’re introducing is the 《Aqua Force》 G Guardian “Blue Storm Hindrance Dragon, Ice-barrier Dragon” with the 【Wave】 ability from the 9th Booster Pack “Divine Dragon Caper”. “Blue Storm Hindrance Dragon, Ice-barrier Dragon” is a G Guardian who gains 10000 extra Shield if you achieve the conditions of 【Wave】! 【Wave】 is an ability that activates based on which number of battles you’re on that turn. 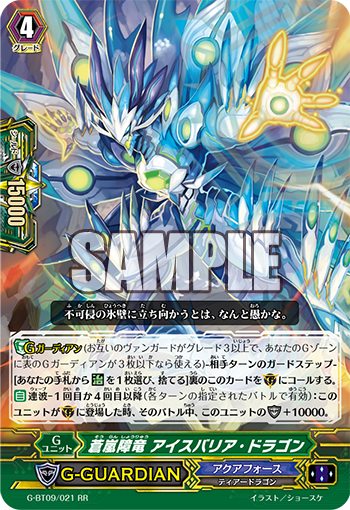 In “Blue Storm Hindrance Dragon, Ice-barrier Dragon”‘s case, it achieves 【Wave】 on the 1st or 4th and onwards battle, making it good for dealing with clans that pull of multiple consecutive attacks. Since since there’s no activation cost for raising its Shield, it merely goes up based on the 【Wave】! By using it together with the existing 《Aqua Force》 G Guardian, “Guard Leader of Sky and Water, Flotia”, you’ll be able to Guard against your opponent’s attacks! Booster Pack “Divine Dragon Caper” includes many cards that further enhance 《Aqua Force》. In the 6th “Weekly Vanguard Column” released today, is centered around “Thavas” and what to expect from him, so be sure to also check out the column! !